RED Zone is 25" (635mm) H20 Vacuum. The AFR2D3 measures the Vacuum restriction caused by the contamination of the Air Filter. 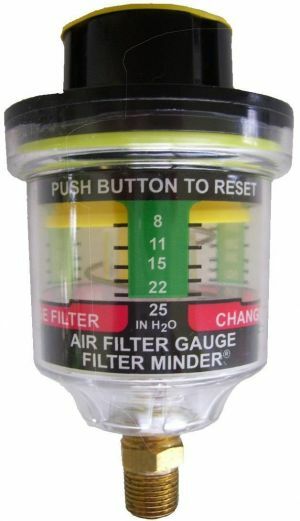 As the internal Yellow Diaphram moves down through the GREEN zone on the Gauge, The Air Filter is becoming increasingly contaminated. When the Yellow Diaphram approaches the RED zone.... Change the Air Filter. The gauge locks in position, so you can read it with the Engine OFF !